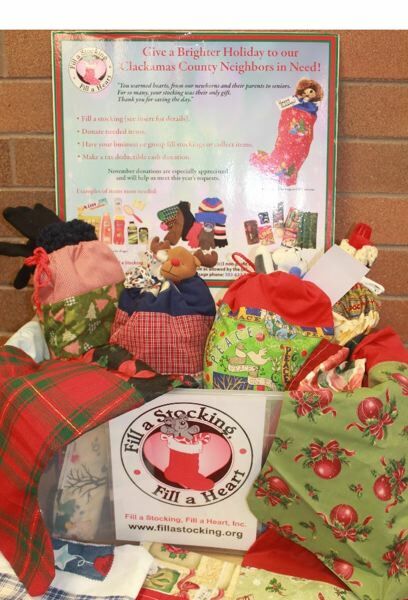 Fill a Stocking, Fill a Heart board members say that they may need to permanently disband if volunteers cannot find a donated space by the beginning of 2019. For 20 years, the nonprofit organization has provided stockings for the less fortunate citizens of Clackamas County, growing from 500 stockings the first year to filling about 3,500 stockings each of the past few years. In each s tocking delivered to county social service agencies are warm hats, gloves, socks, hygiene items and a few inexpensive gift items "to make it a real Christmas stocking." At the end of 2017 Fill a Stocking, Fill a Heart lost an approximately 2,200-square-foot workshop and storage space that had been donated for four years by the Danielsons Hilltop Mall in Oregon City. Unable to secure a new space, the nonprofit's board has suspended normal operations, including this Christmas season. "We're not able to fill stockings this year, and we're heartbroken," said volunteer Claudia Harris. "Our remaining supplies are currently in storage. To minimize or eliminate storage expenses, we reduced our inventory by working with local agencies and nonprofits to ensure that needed items are being distributed this winter." Harris said the small 501(c)3 nonprofit is not able to afford rent for workshop and storage space. All of its workers are volunteers — there is no paid staff — and all donations go to help make and fill stockings. "We worked with agencies in Clackamas County so we knew the people receiving our stockings had little or nothing during the holiday season," Harris said. "We helped the homeless, veterans, and very low-income people." Fill a Stocking, Fill a Heart volunteer Willy Stalker said that the nonprofit organizers have offered to work out of a space as small as 1,200 square feet, but such a potential squeeze was still no help in finding donated local real estate. Stalker said they have talked to the leaders of other nonprofits about partnering, including the Elks, but all lack the space and time frame they need. "We have always worked out of a donated space, and we need a space 24/7 in order to fill the amount of stockings we fill and to accommodate the times our volunteers are available," Stalker said. "Many of us have jobs and other obligations so times vary." Fill a Stocking, Fill a Heart worked with several county agencies that have multiple sites and have requested more than a hundred stockings per agency. So to save money, the nonprofit has used donated items or purchased items in bulk to fill stockings based on the needs of each agency. Agencies that work with people experiencing homelessness have requested stockings that differ from other agencies in that they have items that help keep people warm in the elements. Some agencies can't have certain items, Stalker explained, and volunteers fill the stockings by age and gender, too, so it would be hard to have supplies in different locations. "Our volunteers don't have the space to store the items needed to fill all the stockings for specific agencies," Stalker said. Volunteers are storing various items for Fill a Stocking, Fill a Heart in their homes at the moment, including fabric in three homes, sewed stockings in two homes, bins of baby items in another home and miscellaneous items in other homes. Stalker said that even with distributing 95 percent of the stocking materials to various agencies, the nonprofit still has two storage units, one of which is being donated for five months. "We could try to hold off until May or June with hope but we usually start filling stockings again in January," Stalker said. "If we found a smaller space we would probably have to cut many of the agencies we help or limit them to a certain number of filled stockings. We will keep working hard to find something." Fill a Stocking, Fill a Heart volunteers are encouraging everyone to support an agency in or near their community this holiday season. "We are proud of the impact we have had on the lives of thousands of people in Clackamas County over our first 20 years and are humbled by the generous support we've received from our volunteers, local businesses and all of the community members who have joined us in filling stockings each year," Harris said. 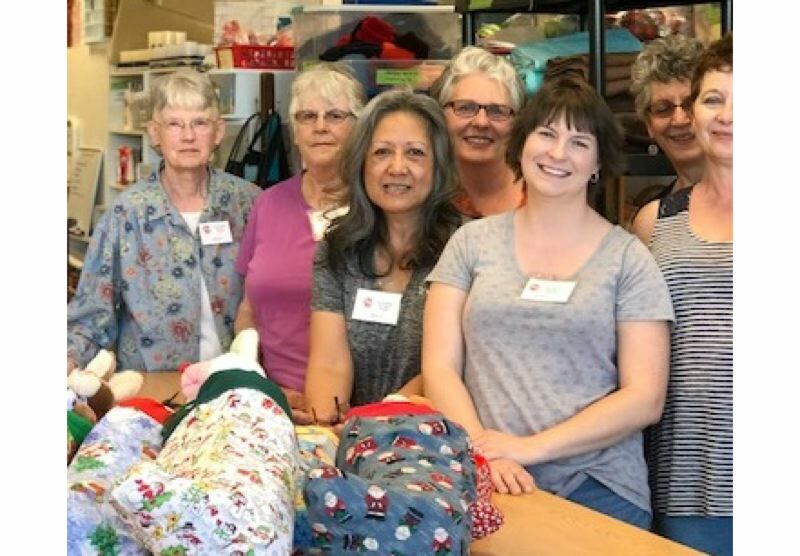 Fill a Stocking, Fill a Heart is open to having a workshop in a neighboring city, although Oregon City is preferred due to its proximity to many past volunteers. To accommodate schedules of volunteers, they would be able to work 24-hours-a-day all year so they can fill all the agency requests.